NEW YORK (CNS) — While not exactly hellish, “Inferno” (Columbia), director Ron Howard’s screen version of Dan Brown’s 2013 novel, does produce some of the purgatorial tedium of sitting around in a dentist’s waiting room or standing at a bus stop. 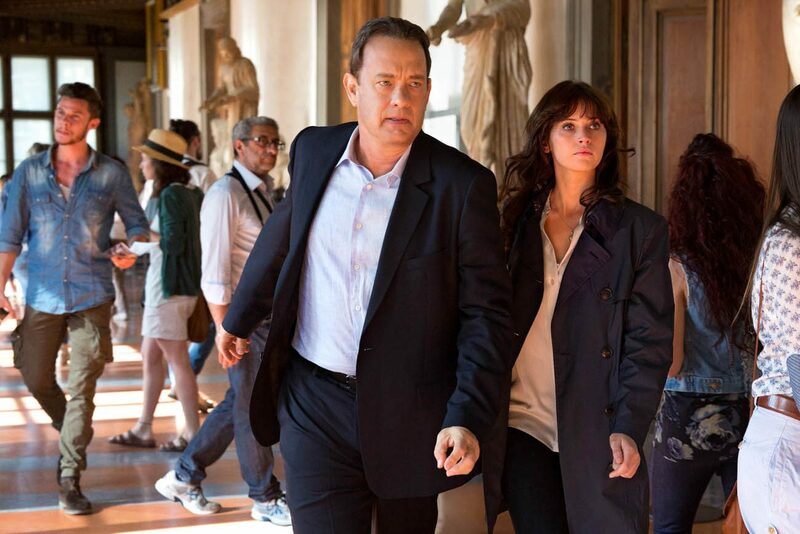 In fact, aside from a few scenes set in such famous locales as St. Mark’s Basilica in Venice and the baptistery of Florence’s cathedral, the church is entirely absent as “symbology” professor Robert Langdon (Tom Hanks) embarks on another of his globetrotting cultural scavenger hunts. The chase begins in confusion: Langdon wakes up in an Italian hospital afflicted with amnesia only to find himself, mere moments later, being shot at by an assassin (Ana Ularu) disguised as a police officer. He escapes, thanks in large measure to the help of British-bred emergency room physician Sienna Brooks (Felicity Jones). An intellectual prodigy, Dr. Brooks has been a fan of Langdon’s books since childhood. Hunkered down in Brooks’ apartment, Langdon fights off the effects of a head injury — Brooks tells him he was grazed by a bullet, but he has no memory of the circumstances — as he tries to piece together why he’s being pursued not only by a killer but by the World Health Organization. Clues having to do with Dante’s Divine Comedy and various works of Renaissance art soon link Langdon’s plight to the nefarious scheming of billionaire bioengineer Bertrand Zobrist (Ben Foster). Zobrist’s paranoid views regarding overpopulation have led him to hatch a psychotic solution: He’s hidden away a pathogen that could kill off half the human race, and has fail-safe plans to unleash it. “Maybe pain can save us,” he winsomely observes. Despite the high stakes and the unpredictable loyalties of the supporting cast — WHO officials Christoph Brouchard (Omar Sy) and Elizabeth Sinskey (Sidse Babett Knudsen), the latter an old flame of Langdon’s, and Zobrist’s security agent, Harry Sims (Irrfan Khan), among them — the outcome of Langdon’s odyssey amounts to thin cinematic gruel. Additionally, while it may be untainted by the theological and historical whoppers that have made Brown notorious, even as they have also made him rich, David Koepp’s script takes an ambivalent stand on Earth’s supposedly overcrowded future. Zobrist’s terrorism is obviously rejected; so too is an idea we’re told he presented to Sinskey for covertly putting sterilizing agents into drinking water. Yet the widespread use of artificial contraception is at least implicitly offered as the proper preventative to the looming horror of a surfeit of humans. While the elements listed below might not otherwise bar endorsement of this thriller for mature teens, the treatment of this theme alone does so decisively. The film contains action violence with some gore, skewed moral values, a suicide, cohabitation and nonmarital sensuality, at least one use each of profane and rough language, a couple of mild oaths and a pair of crude terms. The Catholic News Service classification is A-III — adults. The Motion Picture Association of America rating is PG-13 — parents strongly cautioned. Some material may be inappropriate for children under 13.